Do you use your iPad or iPhone for navigation? Now you can get Waterway Guide data on the popular iNavX app! Fugawi and Waterway Guide Media teamed up to put the new package together, available now from the online chart service X-Traverse. When you open iNavX on your mobile device, use the gear icon in the upper right of the screen to open a menu of options. Select the "Points of Interest" listing on the left, tap "Setup," and choose a Waterway Guide region you have subscribed to (only one can be displayed at a time). Save, and Save again. Waterway Guide data points in that region will now show on the iNavX app as icons, and tapping on an icon opens a detailed information page. TORONTO, Canada – Industry leading online chart service Fugawi X-Traverse announced today the release of a new geo-referenced data layer package by the Waterway Guide for use with the top-selling iOS iNavX navigation app. Available for six regions spanning the East Coast of the United States, the U.S. waters of the Great Lakes, the western coast of Florida and the Gulf of Mexico, as well as the Bahamas, the Waterway Guide offers iNavX users five layers of data adding up-to-date information ideally suited for cruisers and coastal boaters. The uncluttered and detailed Waterway Guide data layers are overlaid on any chart the app-user has installed. The easy-to-use layers include anchorages, navigation alerts in addition to bridge, lock and marina information. New data is posted on a daily basis and incorporates the latest alerts and notices drawn directly from NOAA, the U.S. Coast Guard and the U.S. Army Corps of Engineers, as well as reliable observations from on-the-water cruising editors and research by Waterway Guide’s data integrity personnel. 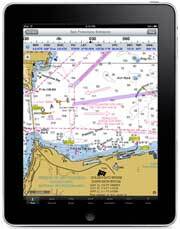 One of the most popular and well established marine navigation apps on the Apple iOS platform, iNavX brings the latest marine navigation features and up-to-date high resolution raster and vector marine charts to iPhone, iTouch and iPad users. The app allows users to add waypoints and routes for planning purposes and can act as a repeater supporting NMEA data over TCP/IP, displaying AIS and instrument data such as depth, speed, wind, and engine. iNavX can also import valuable weather and routing information to be incorporated in the chart display. Waterway Guide regions are available for iNavX as a download from X-Traverse. Available regions are the Chesapeake Bay, the Bahamas, the Great Lakes, the Atlantic Intracoastal Waterway, the Northern Edition and the Southern Edition, and are priced at $19.95 per region. iNavX users will receive an additional 50% off as a special launch price ($9.95 per region). Initial purchase requires a download of the entire data set, which resides on the iOS device; daily updates will use either WiFi or cellular reception to refresh cached data. To learn more about Fugawi or the entire line of Fugawi products, please contact (416) 920-9300 or visit www.fugawi.com. To learn more about Waterway Guide and GPSNavX visit www.waterwayguide.com and www.gpsnavx.com. Fugawi has been an innovator in applications and digital charts for GPS mobile devices and desktop computers since 1995. Fugawi provides software services and connectivity solutions for leading brands of marine companies worldwide and through fugawi.com, the Center for Marine Navigation, provides recreational boaters with charts, software and navigational accessories. Waterway Guide publishes six new guidebooks every year, a magazine, mobile apps and maintains an interactive web site (waterwayguide.com). Integrated across multiple platforms, these planning tools are designed to provide real-time, accurate data and information to mariners. The company was founded in 1947 and is recognized as a leader in travel and navigation guides for boaters and cruisers. For a PDF version of this Waterway Guide/Fugawi press release, click here.